Most teams usually have a go-to top forward line. 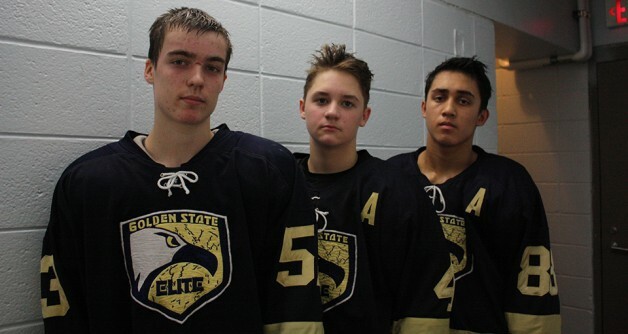 This season, the Golden State Elite (GSE) Eagles nest one of the most dangerous in all of California’s Bantam AAA ranks. Benjamin Biester, Dalton Garcia and Kaleb Ross have pooled their vastly diverse talents to form a line that rang up 18 goals and 36 points through the team’s first six games. Each player ranked in the top eight in California Amateur Hockey Association (CAHA) scoring in the division to start the season. “It’s a gifted group, no question,” said Eagles head coach Mario Morrissette. “They obviously mean a lot to our team and hold a lot of potential. The trio has been in place for the last two years. Biester says the continuity of the line has been beneficial for their development. “Faster” might lead one to believe that this group does most of its damage on the rush; it’s just the opposite, however. Biester, who excels at forechecking, teams with power forward Garcia to produce a very effective cycle. Since the line was assembled, the trio has blossomed into a scoring threat every time it takes a shift. Everyone knows their roles, and there’s a collective understanding that shooting for rebounds creates better scoring opportunities. Biester believes an early establishment of the line’s identity has accelerated its development. “A lot of times, we’ve been encouraged to just get shots off because, after playing with each other for awhile, we know the other guy is going to be crashing the net,” he said. “We’re basically just trying to get the puck to the net as much as we can. Each has gone the extra mile to push their hockey career to the next level. Ross, who centers the line, joined Golden State Elite two years ago. His family rented out an apartment for him so he could reside in San Jose during the hockey season. Ross is originally from Visalia, which is about 45 minutes south of Fresno. Although being away from his family has been hard, he knows his stint with the Eagles will pay off. “My team is like my second family,” said Ross, who hopes he’ll eventually have the opportunity to play in college while earning his degree. “It’s hard to live away from your friends and family, but it’s what I’m willing to do because I love the game. Garcia won a CAHA state championship at the Pee Wee AA level with the Santa Clara Blackhawks. Soon after, he made the tough choice to leave his friends behind. Garcia skated with Morrissette in the summer following that state-title run and decided to join Golden State Elite. Most of that Blackhawks’ Pee Wee team ended up with the San Jose Jr. Sharks. Garcia feels a sense of rivalry when his team squares off against its teal counterparts.